That forms idea for the stock picking contests has been an absolute game changer for me thus far. GREAT to hear! Hope 2019 goes smoothly! Going to be giving this thread one final bump here..
One more thread bump in here. I thought this was an interesting idea for our yearly contest that was brought to my attention by @Lico Inv over on our live chat over this past weekend, and just thought to share with y'alls as well. Yeah, cool idea. I'd participate! Even though @Lico Inv suggested same rules as other contests, because it will be billed as a "portfolio" contest maybe the rules for this contest should clarify that it is simple price return only, not total return (essentially, ruling out divies earned). Unless, of course, the community wants to include divies, but that sounds like more of a bookeeping nightmare. But, yeah, it's a great idea! So, I'm currently fixing to setup a test spreadsheet so y'alls can take a quick peak at how something like this might come out. Also, I was thinking of maybe conducting this contest on a quarterly format instead of yearly? Then, that would give members something to look forward to every 3 months. What do y'all think? Anyway, I'm almost done setting this test sheet up. Will post it in here once done. Oh and I think we can just run this like the other contests, however, unlike our other formats participants will be making more than 2 picks (10 in this case). Once I've posted my spreadsheet I think you guys will get a better idea with how this might work. OK, here we are! So, I was able to modify another one of my spreadsheets (team challenge sheet) to come up with this new one, so I luckily did not have to set this up completely form scratch! <-- click there to view! So, basically how this will work is that there will be individual sheets for each participant with their 10 picks within the same spreadsheet. Sorted from highest to worst ROI. ...and then what we have here is the main standings page, where I'm taking the total combined return of all 10 picks for each participant and then have them sorted from best to worst. I'm pretty much following the same format as our other contests. This one just simply allows for making additional picks. I'd like to stick to this format if possible since I'm most comfortable with it. I believe this is what @Lico Inv was thinking of for this new contest idea. Let me know for sure if I got this correct Lico. Thanks! I like how it is consistent with the other contests. I will enjoy seeing and following everybody's picks, too. This was an inspired idea! Yes. This is Awesome. It would be cool to have other stock info (Fundamentals) visible in the chart- but I don't wanna be greedy. This should be enjoyable and interesting. I've usually done 1-Yr, but the 3-mo. works too (I have a feeling it might go by too fast though). I think @Three Eyes is right about excluding divs due to accounting hassles. And I would prefer Longs only- as if buying the Shares (but I believe a general consensus acceptance could vote). And is it 'Total ROI' or 'Average ROI' [because 'Total ROI ' could cause one stock's (or a couple) return(s) to have a Great effect on an otherwise very well or poorly performing portfolio; whereas 'Avg ROI' would give a better idea of the base of the individual's Overall Portfolio]. Those are some good points there, and thank you for chiming in @Lico Inv! I'll play around with my sheet sometime today and see what I can add to it. We can do a 1yr format, but the reason I suggested 3 months is that so participants have something new to look forward to every quarter. Since I'd really like to keep the contest "format" almost exactly identical as our others, I would say we keep the option for shorts open as well. But, we can put that up for a vote too and see what the others ultimately would suggest. And yes, in my example that I had posted above, I am going by the total combined ROI of all picks, but we can use the average. No problem there. I'll try to post an update of my spreadsheet that I posted yesterday, and see if I can include some other stock data to it. There isn't a whole heck of lot of time here, so if we're gonna run this in here we'll need to get right to it before the new year. @Lico Inv - here's just a quick update post for ya. So, I went ahead and added a column for "avg roi" on main the standings page, whilst still keeping total as well. Furthermore, I also went ahead and added additional stock data to the spreadsheet, but I did not feel like formatting the whole sheet from scratch again to fit the data into one screen, so what I did was just add them at the end of the sheet. If you want to view the additional data all you simply do is scroll to the right. How is that looking now? @Lico Inv I guess it would help if I also posted the new spreadsheet link in here...whoops! Here it is. Go ahead and look it over, let me know what ya think so far. Amazing. Perfect. This should be very interesting and fun. I guess we can decide (via vote) to have Longs only, or Shorts and Longs. I assume portfolio deadlines will be due around Jan 1? Looking forward to this. If you want, I can tell consistent chatters in the chats and contests about this to get maximum participation. Awesome. I have issued this same 'Portfolio Challenge' in the past to countless individuals/ investors/ groups- and Portfolio-Making is a favorite of mine (and a skill-building and learning experience that we All should benefit from). Yeah, the first trading day of the new year (Jan 2nd) is when I'll put the deadline for participants to get all of their picks in. Since this is going to be my very first attempt at a "portfolio challenge" at Stockaholics, I am thinking of running this first challenge as a "trial run" as I do any first contest ideas on the forums. I just like to get a feel for how this is going to work out for me during the first 3 months of the new year, and if I can even manage it, especially with all of the other contests I have running in here. If all goes well, then I think we can go ahead and make this into a regular quarterly challenge on the forums. I agree, I think this is going to be a lot fun for everyone since this is a lot different than what we have been accustomed to on the forums for so long. Lastly, I was going to ask this in here as well, but do you guys think we need to add leaderboards for this portfolio challenge? I'm thinking no, since this contest is only going to be run on a quarterly basis. This first run though, since it is only going to act as a trial run we won't be needing it...but what about for future contests? Anyway, I'm going to be setting up the the thread soon, so be on the look out for it! I know we're kind of running short on time with there only being a handful of days left in the year, so I just went ahead and setup the thread tonight. 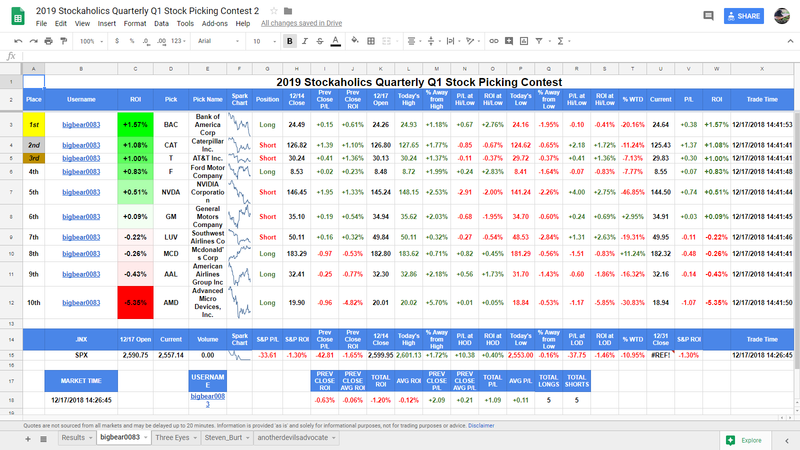 ***TRIAL RUN: Stockaholics 2019 Quarterly Q1 Portfolio Challenge*** <-- click there! Let's carry all of the discussions pertaining to this portfolio challenge in there! Cool. I don't think any leaderboard updates are necessary. the ROI's should speak for themselves. This shouldn't need any manual updating- just the Initial setup. I'd rather a 1-yr [I can get a better feel for companies in at least a 6-mo. or longer timeline], but a 3-mo beta test trial works. Thank you for setting this up. We can all benefit from it. Let me know if you need any help with this Challenge/ thread/ etc. 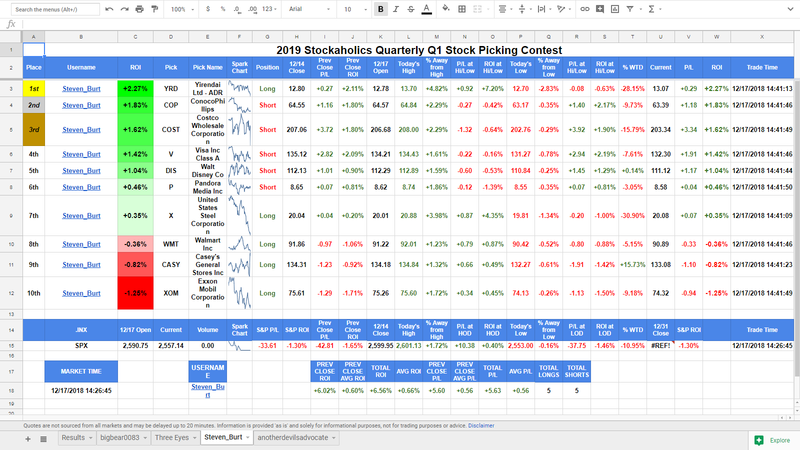 OK, so I wasn't too sure where to post this to get everyone's attention, but I wanted to quickly bring to y'alls attention that I've been testing out the Google Forms for a new Stockaholics Watch List idea, and I just wanted to get some quick feedback from the community if possible. I'm now trying my hand at the Google Form for the Stockaholics Watch List...I believe I've got it all setup properly but I'm not 100% sure. I've been really utilizing Google Forms into my spreadsheets a lot lately. I'm really amazed how effortless running some of this has become for me, such as the Stockaholics contests. Don't mean to sound like a broken record saying this, but seriously, I wouldn't have ever known about any of this if not for @Three Eyes bringing the idea to my attention last month. Anyway, while I'm at it here, I also want to make sure that we're all good on the changes that have been made in here the past few weeks, as we are just literally 10 days away from 2019! If anyone should have any other rule changes to propose for 2019, be sure to make mention of it in here soon. I really want to avoid changing anything up once we're in the new year. I like where this is going...I have a feeling there would be a lot more participation in watch lists if users could add and remove tickers themselves! I tried the Google Form, and posted my experience over here. Lico Inv and bigbear0083 like this. This might be an idea for a possible rule change in 2019 for the stock competitions. As was noted here, two of our members seemed to forget to post their market direction votes to the thread, thus possibly not being added to my voting record spreadsheet if they don't check back in and have their votes posted to the thread. This has been a "rule" on our market polls for as long as I can remember running these competitions on the forums. My question is, do you guys think we should change this rule for next year and just add members votes to the spreadsheet regardless of not getting votes posted to the thread, but are actually clicked in on the poll that you can see what they voted for? I'm almost thinking this is a no-brainer of a change, but I wanted to first get some input from the community as well. The main reason why I have participants needing to also "post their votes" on thread, is so that the threads get bumped to the top so people who haven't seen the threads might get a chance to see them at a later time...and also so I can hit participants up with "likes" at the end of each market day, week, month, quarter, year if they got the direction correct. Anyway, I am contemplating changing this rule for 2019 to allow members to just "click in" their votes on the poll at the top of the threads and not making it a requirement that they also need to "post" it on the threads to simply be added to the voting record spreadsheet. I am contemplating changing this rule for 2019 to allow members to just "click in" their votes on the poll at the top of the threads and not making it a requirement that they also need to "post" it on the threads to simply be added to the voting record spreadsheet. Do you find it is usually peeps forget to post on the thread, as opposed to posting on the thread but forgetting to click on the poll? I guess if everyone fairly consistently clicks on the poll, then your proposal makes a lot of sense! Hopefully, enough of us will want to post our rationale anyhow that it will serve to bump the thread. Do you find it is usually peeps forget to post on the thread, as opposed to posting on the thread but forgetting to click on the poll? This is interesting you bring up. So, in my observations of running the threads over the years, I can make a case that it's about equally the same. Not one more than the other. Hopefully, enough of us will want to post our rationale anyhow that it will serve to bump the thread. 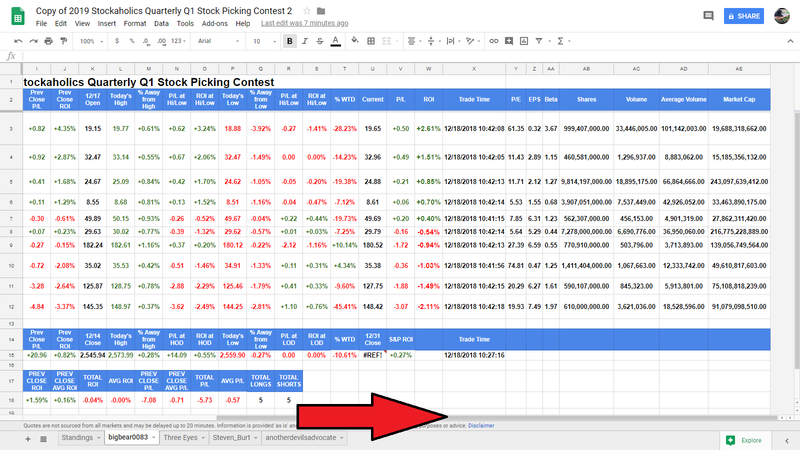 Speaking of "rationale" I am now contemplating adding another field in the google forms for members place rationale with their stock picks (of course only making it optional for everyone), and adding that to the spreadsheets. Obviously, the participants who do add rationale would get the extra points in the members leaderboards. Really glad you brought that up in here now @Three Eyes, as we're only days away from the new year. I personally think it wouldn't be a bad idea. What do the rest of you guys think? I'm actually going to be attempting this out on our r/StockMarket subreddit community soon. Gonna be trying it for the January monthly 2019 contest there. You've been amazingly helpful with all these new ideas for the contests @Three Eyes. I really cannot thank you enough!